Please wear a suit. You should avoid wearing casual clothing such as jeans or t-shirts. You will be speaking with company HR representatives so it is important to make a good impression. It is not necessary to bring printed CV however, if you have one, please submit it in receptionist on the day. 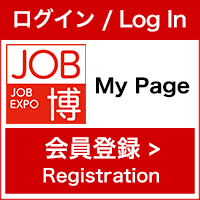 and gather related information for your job-hunting in Japan.